The small fishing port of Cabo de Palos is expanding rapidly in keeping with the rest of the Murcia region. The harbour area is very busy in summer but not surprisingly very quiet in the winter. There are numerous restaurants dotted around the village. Given their position, most specialise in seafood. Those listed are just a selection of the many restaurants in the village. 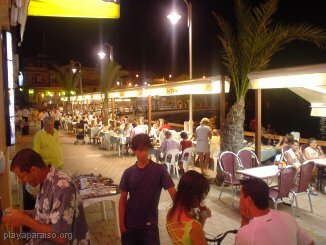 El Faro 968 564960 A well-established restaurant in the heart of Cabo de Palos offering a good selection of tapas and Spanish cuisine. El Navegante 968 563312 Located in Cabo do Palos with a wonderfully elevated position overlooking the bay. Ask about the daily specials. Advisable to book in advance. El Pez Rojo 968 563109 Centrally located set slightly back from the harbour it offers a good selection of fish and seafood, though it can be expensive. Open for lunch and dinner. Closed on Mondays and at Christmas. La Taberna Del Peurto 968 146021 Not sure of the precise location but we have been told that 'it is on the left at the back corner (of the harbour?). It has seats at the waters edge just before the corner at the top where the water ends and the restaurant itself is set back a bit'. Recommended for a wonderful seafood platter and goats cheese salad. La Tana 968 563003 Another favourite. Located in a prime location next to the entrance of the fishing harbour, La Tana has a great selection of seafood and paella. In the summer sit outside and watch a selection of boats come into the harbour while you eat a delicious meal. 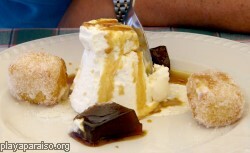 Popular with the Spanish, and holidaymakers alike, it is advisable to book a table especially in the busy summer months. A particular favourite with Spanish seems to be the plate of mixed fried (or grilled) fish. Miramar 968 563033 Miramar enjoys a good location in the heart of Cabo de Palos next to the harbour, and has an excellent reputation for fish and other seafood dishes. Paella, caldero and monkfish casserole are specialities. Also of note is the Miramar desert. This consists of almond ice cream, caramelised pumpkin and fried milk. It is great for a sugar rush and if you are looking for a quick way to pile on the calories! Another restaurant where it is advisable to book in advance - very popular with the Spanish. During 2007 the Miramar was refurbished and now glass walls looking out over the harbour and sea. 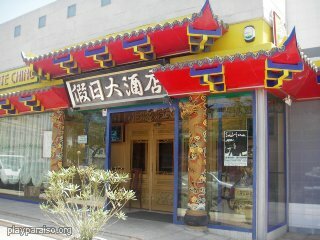 Restaurante Chino Set back down the same side road as Mercadona. This is not the world's most authentic Chinese restaurant. However, it's very popular and with good reason. The food portions are overwhelming and it is very cheap. Inside it is all marble and fresh linen. The staff are friendly, efficient and in a hurry. The lunch menu consists of two courses with coffee, a drink and a glass of meths (well it looks like it) and all for under 6.